Introduce a little shimmer to your look with this stunning gilet by Marina Rinaldi’s Persona. 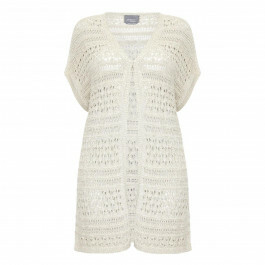 Striking with lurex detailing, the drop shoulder gilet comes with a loose crotchet-like pattern. Ideal for smart/casual wearing with a long sleeved top and a pair of jeans. Complete with sneakers or sandals. Navy lurex crochet style drop shoulder gilet. 80% Viscose, 20% Metallized Fibre. Hand Wash Only.